This pull over Irish sweatshirt features an 80/20 shrink resistant cotton blend. This Irish sweatshirt for women features clusters of embroidered shamrocks along with the Claddagh in the design of this gorgeous, subtle, and so wearable ladies' sweatshirt in a color named warm green. 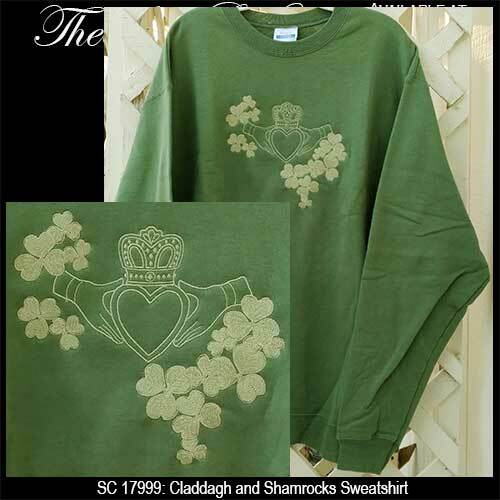 This women's Irish sweatshirt is embroidered in the United States and it is received with the Claddagh legend along with a shamrock history card that are compliments of The Irish Gift House. This pullover Irish sweatshirt is only available in limited sizes.